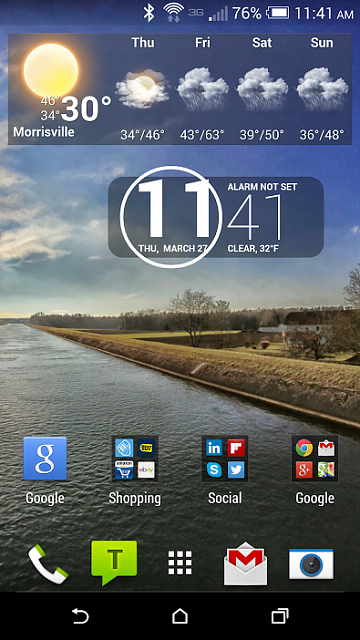 Share your HTC One (M8) screenshots and setup! You guys know the drill. New phone, new Sense, new things. Let's see screenshots. 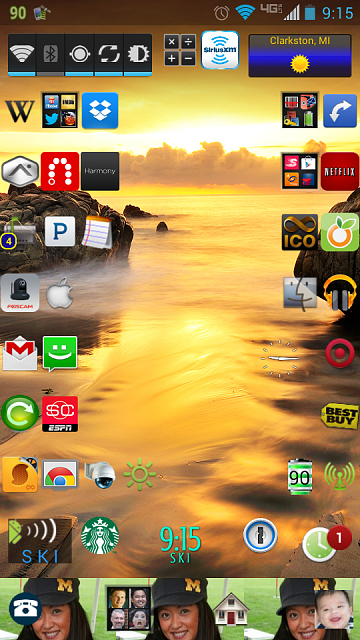 Please try to include at least basic info, such as wallpaper, widgets, launcher, or other settings you've applied. Nova launcher, stock wallpaper, click icons. Widget locker with same wallpaper. I Can Be Your Hero, emirozmen, ibcop and 3 others like this. I'm old school in my layout. brad4560 and batsai like this. Rose4uKY and cmhsam like this. Love your setup there! Here's a question though, can the software button bar be made transparent or opaque somewhere in settings, or do you just have an edited background picture set up to have that area be black? Thanks. I didn't change anything as far as the button bar. I don't even know if there is any way of changing that. I noticed on Kygator13's screenshot above that it's transparent. It may be dependent on the photo. I just tried changing them. 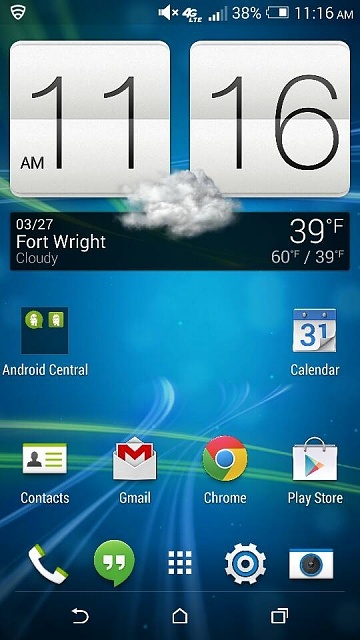 The HTC backgrounds give the transparent bar and my photos (like the one I'm using) get a black bar. Keeping mine very basic for now. I usually install a third-party launcher like Nova, but for the M8, I decided to give Sense a chance. So far, it's not bad. cizzlen, rion_j and Morty2264 like this. Tried setting a picture I took in store as the wallpaper on their display model as a test today, I think it must be resolution dependent, the picture I took had the transparent bar when set as the wallpaper. nokia4life and perfecthybrid like this. What's the box with the smaller sized icons at the bottom (above the tray)? That doesn't look like Sense. I assume a widget of some type? Thanks. Launch-x PRO. Been using it for years. LOVE This!! can this all be done with default stock?? 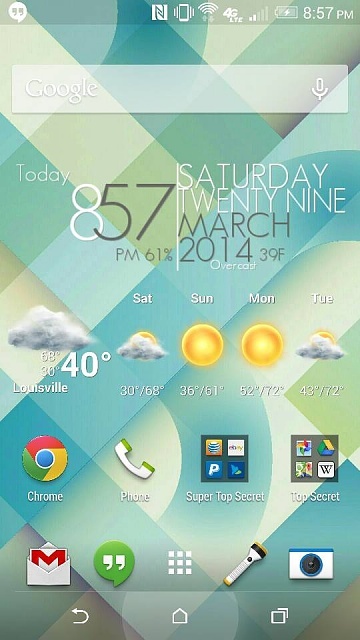 Stock launcher. 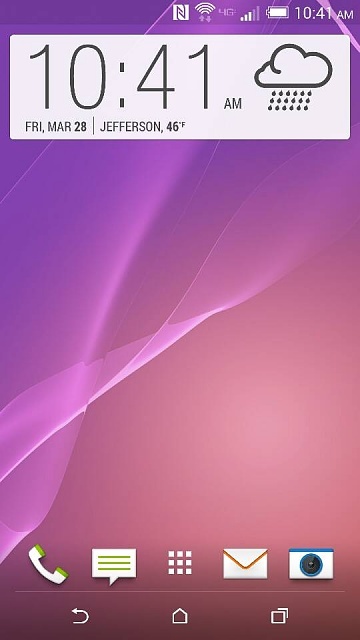 One More Clock Widget for clock. 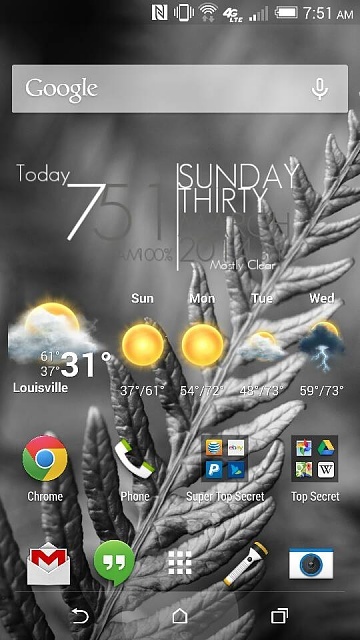 Beautiful Widgets for the weather. ErnstMach, Rose4uKY, BldyIdt and 2 others like this. Does this mean that the "traditional" Sense animated flip clock is still included in Sense UI 6.0? ErnstMach, BldyIdt and cizzlen like this. Got my M8 gold version ordered with Best Buy. Can't wait! I plan on duplicating what I'm currently using (Nova) on my Moto Razr Maxx. I love having access to nearly 60 operations from my main home screen with just one touch or swipe gesture! cizzlen, Lolken21, abastuba99 and 3 others like this. Where did you get that flashlight app in your dock? Is it not stock or am I crazy? Ordering an HTC One (M8)? Separate plan? I'm in Europe. Can I order HTC One (M8) from UK?